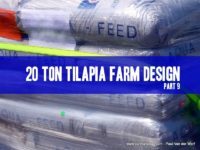 Now we understand our batching through our production and our previous density calculations on our 20 ton tilapia farm design, we move onto defining the tank sizes and number of fish tanks through each stage. There is two parts to tank sizing. The first (this one) is focused on premade tanks such as roto molded, fiberglass and the like that you purchase at preset sizes. 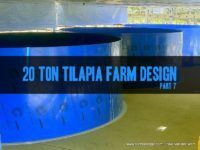 The second part is for determining the tank size you will need to build onsite for welded HDPE, concrete or any other method for making tanks onsite. Culture tanks can be made of just about anything. However the most preferred materials are high density polyetheline, concrete and fiberglass. In this scenario we are looking at roto-molded HDPE tanks we can buy from our local manufacturer. In out quarantine we have 6 x 500 liter tanks. These are quite small and can be upgraded to 1000 liter tanks but keep in mind we are dealing with very small fish and chasing these fish about in a large tank can make life difficult. We would need to upgrade to larger tanks if we were to bring in larger fingerlings. However in our case we have 0.5 gram fish coming in so we want to be realistic about the size of the tanks in the quarantine. The other consideration for the tank size, is the overall size of the quarantine system itself. Keeping in mind at the end of each batch we sterilize the system and dump the water. So a larger than needed system may see you waste more water than needed. As we are spreading out the one batch of fish through the 6 tanks in the quarantine we will only need 6 of them to gain the 3000 liters required to maintain a reasonably safe density for the small fish. In the other two stages we grade into each we have three batches of fish moving into them. Back to our staging we calculated the requirements of one cohort only. As we have 5 weeks quarantine, then 15 weeks for each of the two stages following we will have 3 batches of fish go through the quarantine for each of the following stages (15/3). With that in mind we will need to multiply the amount of tanks required for each batch. 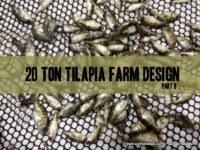 The fingerling and grow out stages each need 4 of the tank sizes per batch or cohort of fish giving us a total of 12 tanks each stage. When using premade tanks with set volumes, it is important to check their operating volume. Most tanks will be advertised as X liters when they are full to the brim. You will need to allow free board so be sure to allow for that or your density may increase. As you will note, there is a density check for these tanks. This is a check on the set size of the tank volume to what we need. The premade tanks will not fit your calculation numbers so it is important to check the density on the actual volume of the tanks to be sure it has not gone up too far over your set limit. Remember we set the desired fish density in the previous part of this design series. Note in the final grow out stage we set the desired density to 45 kg/m3 however in our tank sizing density check it is now nearly 50 kg/m3. If this is acceptable you then these tanks will work just fine. If it is too high, then you will want to increase the tank size for that stage to the next tank up or add more smaller tanks. 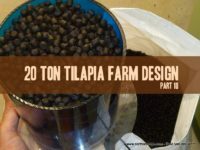 It would be preferred to add larger tanks than more smaller tanks, keeping in mind for every tank you add, you add a labor component to the cost of the operations. It takes just as much work to manage a 50,000 liter tank as it does to manage a 5000 liter tank. For every tank you add you also add the valves, pipework, sensors and other capital. My preference is to have an amount of tanks between each stage so you will move one tank from one stage into one bigger tank in the next stage. Next we will take a look at the calculations for tanks you will make onsite….